As we approach the end of 2017, we wanted to update you on what’s been an exciting year of expansion and impact for the Maccabee Task Force. Just two years ago, we launched our first campus-based initiatives. Our logic was simple. We saw that the most effective efforts to delegitimize Israel were taking place at the grassroots level — campus by campus, relationship by relationship. So we decided that the most effective way to change the climate on these campuses was to go local in a big way. Grassroots work is neither easy nor glamorous. But it happens to be extremely effective. We started small. We tested programs. We scrapped what failed. And we’ve doubled down of what worked. This fall, we brought our tried-and-tested program to 40 American campuses facing aggressive anti-Israel campaigns. 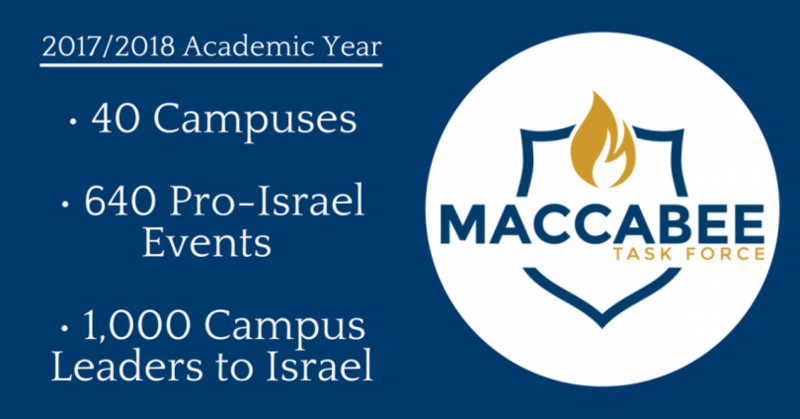 On each of these campuses we’re funding pro-Israel students to implement their best ideas for promoting Israel. And we’re offering these students the opportunity to adopt the most impressive initiatives we’ve funded on other campuses. The “action plans” we generate together — plans which we fund and the students execute — end up dramatically increasing both the quality and the quantity of pro-Israel activism on each of our campuses. By the time students take their finals this spring, we will have funded over 640 pro-Israel events on these 40 campuses. Many of these events will be public demonstrations of support for Israel aimed at “taking back the quad” from the Israel haters. 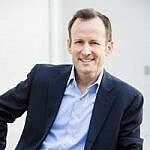 Others will be more targeted, aimed at recruiting and training new pro-Israel activists as well as building new coalitions which reject the simplistic scapegoating of the BDS movement. We’ll also be funding a trip to Israel for each of these 40 campuses through which we’ll bring almost one thousand campus leaders and influencers to see the truth about Israel for themselves. We’re gearing up for a busy spring. We’re excited to help so many dedicated students do so much excellent work to seize the momentum for Israel. We’ll keep you posted on our progress. And, with your support, we look forward to expanding our program to even more campuses next year.